Every Exmark customer instantly benefits from our machines' legendary reliability and durability. But why stop there? Now that you have your mower, accessories can add versatility. To achieve this and fully release your machine's potential, we offer a wide range of innovative accessories. Each one is uniquely designed to provide you with the versatility you want to get the most value out of your machine. 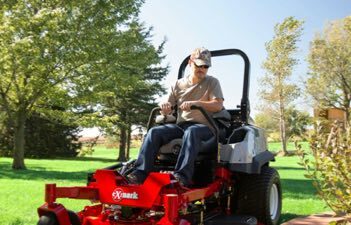 Lawn mower accessories are a great supplement that allow for extra ease of use and care, making your landscaping job extra pristine and efficient. Some of the accessories we offer include equipment covers, bushel baggers, weight sets, turf stripers, micro-mulch systems, floor pan mats, hitch kits, and maintenance kits. To help with your accessory selection, we've gathered together the information and made a convenient, sortable list based on specific models and series. Whatever your accessory need is, we can help. Bring your machine up to the next level today by taking full advantage of what Exmark offers. Note: The decks were sold separately from 1994-2012 on the following products: Turf Tracer, Navigator, Front Runner, Turf Ranger and Explorer. Select 'Deck' as the product type when looking for accessories specific to FMD, CD and FR decks.